Mary Nellis, Assistant Director for International Students and Scholars, Global Engagement Office, will be leaving her position at UM on May 11, 2018. GEO will miss Mary, who is irreplaceable, and we wish her good luck in her new career and future endeavors. Mary started working at UM as a student, and worked on campus for almost 15 years total. After three years as a student she studied abroad for her last year of undergrad studies and started as staff when she came back. Mary has been staff for 12 years. She also obtained her Master’s degree at UM while working full-time. Mary will be moving to Troy, NY to take the position of Director of International Student and Scholar Services at Rensselaer Polytechnic Institute. On April 18th, Mary presented "Scratching The Surface: A Fulbrighter's Perspective on South Korea" at the UC as part of the Mansfield Center Spring Lecture Series. In June 2017, Mary joined a group of eight International Educators from across the U.S. to participate in the Fulbright International Educator's Seminar (AIEA) in South Korea. This two week seminar introduces American International Educators to the higher education system in Korea, introduces the group to their Korean counterparts in international education, and exposes them to a wide range of cultural activities. Mary spoke about the Fulbright AIEA experience, professional perspectives, and cultural themes that emerged throughout the trip. She and the other educators visited twelve different universities in Korea. 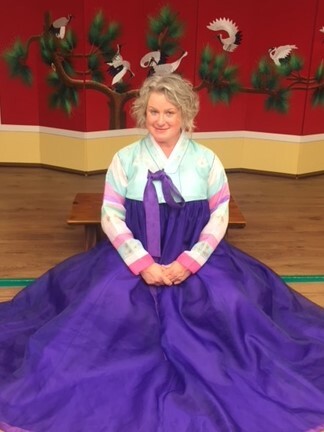 Cultural highlights of Mary's trip included touring Gyeongbokgung Palace, visiting the DMZ, enjoying opera at the Jeongdong Theater, and visiting Haeundae Beach and Shinsegae Spa Land in Busan. The IEA Seminar is the only nonacademic Fulbright award, designed to help U.S. international education professionals and senior higher education officials. To learn more about the Fulbright program, visit http://www.cies.org/. For more info on the IEA Seminar,visit https://www.cies.org/program/fulbright-international-education-administrators-seminars. Click here to subscribe to the Global Engagement Office quarterly newsletter.